Your love, your event will give these women a second chance, give them HOPE that FREEDOM exists! Hi! We are the Wallace's or "The Barn People" as we have been come to be known as lately! We are a family business so you can count on family values and professionalism being our first priority! Kurt and Amy have seen all there is in the wedding industry! 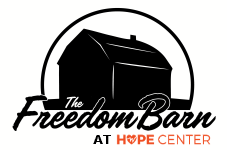 ​Specializing in customizing your wedding day to your specific needs Kurt and Amy are wedding pros and bring that knowledge and skill to The Freedom Barn! ​Coming from a Marketing and Event Management background with 6+ years of experience having work​ed for companies such as the Indiana State Fair Commission and 99.5 WZPL and 107.9 The Mix as their Promotions Director, Kimberly has the experience and skill to make your day a success! She can work with you on making sure your vision comes to life! And of course... Tater, the Barn Pup.